Over 100 physicians and 40 instructors from around the world gathered in Madison on October 21-24, 2015, for the 20th annual Prolotherapy Research Symposium and Conference, an in-depth clinical education and research event held on the University of Wisconsin-Madison campus. 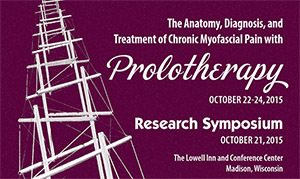 The 20th annual Prolotherapy Research Symposium and Conference was held in Madison, WI on October 21-24, 2015. In prolotherapy and other forms of injection therapy, a physician inserts a needle containing an irritant or regenerative solution, such as dextrose, into a joint space, or at a ligament or tendon attachment, to treat the affected tissue—and ultimately relieve joint and myofascial pain. Prolotherapy is most frequently used to treat knee osteoarthritis, low back pain, tendinopathies, and myofascial pain, a chronic condition that affects the fascia, the connective tissue covering the muscles. The two-part conference began with the one-day Prolotherapy Research Symposium, in which presenters reviewed recently published and ongoing clinical research studies on prolotherapy and related regenerative injection therapies. Studies have shown that prolotherapy can be highly effective, especially for osteoarthritis and tennis elbow, but clinicians need specialized education to administer it correctly. In the second part of the conference, The Anatomy, Diagnosis, and Treatment of Chronic Myofascial Pain with Prolotherapy, attendees received hands-on basic and advanced training in anatomy and proper injection techniques by expert practitioners. Among them were the UW Department of Family Medicine and Community Health’s (DFMCH) Bobby Nourani, DO; David Rabago, MD; Deborah Raehl, DO; and Michael Weber, MD. “This clinical conference provides necessary didactic presentation of core anatomical injection techniques along with hands-on education delivered by clinicians with years of expertise,” explained Dr Rabago. The annual conference would not be possible without the support of Mary Doherty, Hackett Hemwall Patterson Foundation president and conference coordinator, who planned the event along with Dr. Rabago. Doherty is a former UW Health Verona Clinic employee and the partner of the late Jeffrey Patterson, DO, who was an international expert in prolotherapy. Institutional support was provided by the University of Wisconsin School of Medicine and Public Health and its Office of Continuing Professional Development in Medicine and Public Health; and the UW Department of Family Medicine and Community Health. Martin Gallagher, MD, DC, whose generosity supports the Dr. Martin and Charlotte Gallagher Scholarship for Prolotherapy. The Hackett Hemwall Patterson Foundation, which provided seed funds to create the UW Prolotherapy Education and Research Lab (UW PEARL), a collaboration between primary care and specialty clinicians aimed at furthering prolotherapy education and research.